Day 3 of the Marketo Marketing Nation Summit brought even more great insights from some of the most renowned experts in the industry. We continued our adventure with further high-value breakout sessions. The first session of the day looked at Account-Based Marketing (ABM) in terms of how to acquire high-value accounts and actually incorporate the principles into your marketing and sales strategies? When it comes to deploying ABM, it’s essential that marketing works in lockstep with sales to identify and target key accounts, manage and engage named account lists across channels, and measure ABM programs to optimize results. 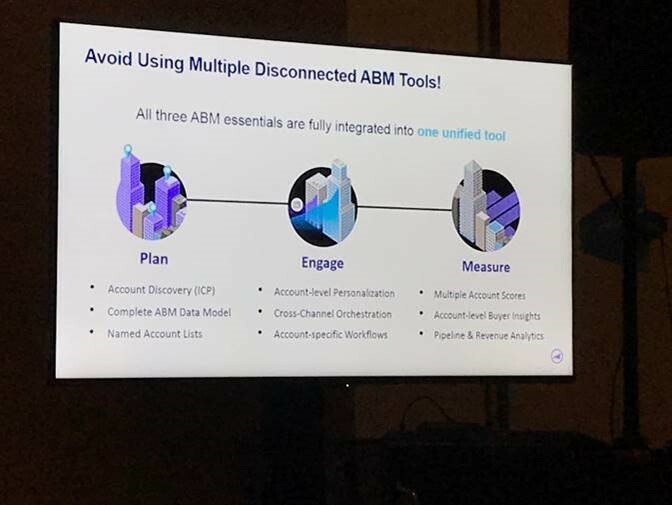 In this session, we covered how Marketo enables you to implement a successful ABM strategy across its Engagement Platform using Marketo ABM and other products. As we all know, ABM lead gen strategies are increasingly gaining importance in B2B marketing, and are far more efficient than individual lead gen. B2B marketers can apply the same strategies used in individual lead gen efforts, but need to adjust their concept of targeting to industries, verticals and company sizes. 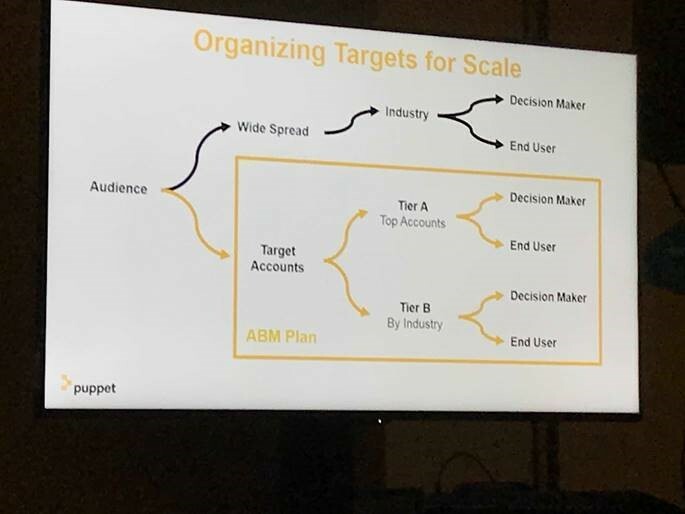 The speaker (a marketer from the company Puppet) stressed that marketers need to avoid using disconnected ABM tools. They instead need to focus on three essential steps (Plan, Engage, Measure) and integrate all three into one unified tool. Another key point was that continuously testing and tweaking the paid media mix is essential to developing a sound ABM strategy. For instance, his software company had strong success through direct mail, and more old-school phone call follow ups, which one would not expect to work in the digital age. Take a look at the images below regarding how Puppet organized ABM targets for scale. The 2nd and final session of the day focused on Marketo’s effort around user experience. This session took us on a guided journey through Marketo’s breakthrough new user experience, which is designed from the ground up to help you work faster and smarter. During this session, Marketo’s product team showed the power of the Next Gen UX and laid out an entirely new Marketo. Updates to iconography – new intuitive logos for the tree, folders, etc. New filters for the tree – ex. Filtering for Trigger campaigns, filters for labels, etc. 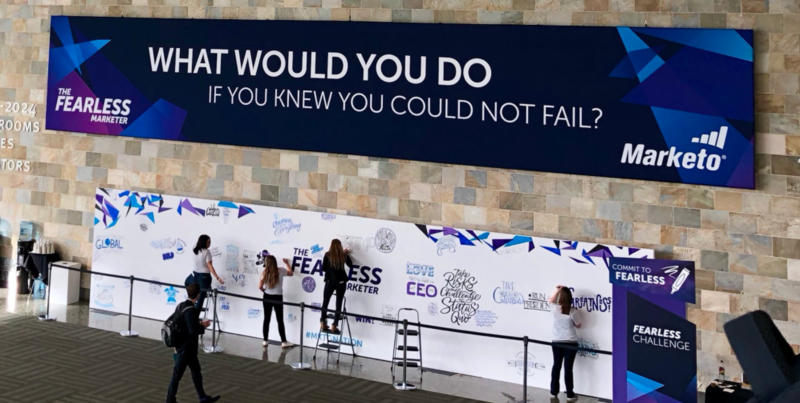 Check out our roundups of Marketo Marketing Nation Day 1 and Day 2 too!